Theodore was the eighth Archbishop of Canterbury (668-690). He was a Greek from Tarsus, the home of St Paul. 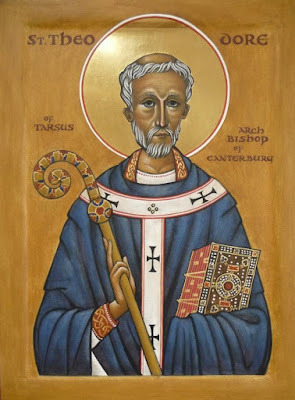 He was a highly-educated monk living in Rome who was quickly advanced through all the clerical ranks and was consecrated as Archbishop of Canterbury at the age of sixty-five. Theodore arrived in Kent when he was almost seventy. In spite of his age, he was energetic, travelling throughout England founding churches and consecrating bishops to fill those Sees which were left vacant by an outbreak of plague. He also created new Sees and established a school in Canterbury where Greek was taught. In Northumbria, Theodore settled a dispute involving episcopal succession. St Theodore summoned a council of the entire English Church at Hertford in 672. Not only was this the first church council in England, it was the first assembly of any kind attended by representatives from all over the country. In 679 he convened another synod at Hatfield to maintain the purity of Orthodox doctrine. Theodore died in 690. Under his leadership, the English Church became united in a way that the various tribal kingdoms did not. The diocesean structures which he established continue to serve as the basis for church administration in England. He was respected for his administrative skills, and also for his moral and canonical decisions.